The landscape of North Harris is unique. 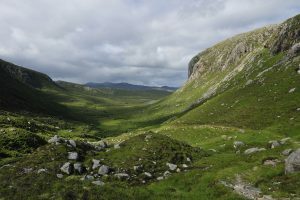 The hills are rugged and mountainous despite their modest altitude, and are dissected by valleys and lochs that have been scoured by glaciers. The evidence of glaciation is everywhere and the landscape is littered with huge rocks, known as erratics that have been deposited by receding glaciers. Peat has formed in many valleys and on hill sides, but on the more exposed ridges and summits soils are thin or nonexistent and bedrock is exposed at the surface. The bedrock is predominantly made up of Lewisian gneiss which can be up to 3 billion years old and is some of the oldest rock in the UK. The fjord-like sea lochs that form boundaries to the estate on several sides have also been formed by glaciers, and Loch Seaforth is the longest Sea Loch in the country. Sron Ulladal, also known as “The Scoop” to climbers, is one of the largest overhangs in Europe and a climb of almost mythical status, which is rarely even attempted. The treeless nature of the terrain and the absence of manmade structures across much of the land gives the area a unique atmosphere with magnificent panoramic views. This spectacular scenery has been recognised by the designation of the entire estate as part of the South Lewis, Harris, and North Uist National Scenic Area (NSA).